Combine all the ingredients given for batter except water and mix. Now gradually add water, whisking at the same time to get the right consistency of the batter. It should not be too thick or too runny. The consistency of the batter should be good enough to coat the bread sandwich. Meanwhile, in a mixing bowl, combine all the ingredients for filling and mash. Take one slice of bread and spread 2 tbspns of potato mixture onto it and cover it with the other bread slice. Cut into 8 triangles. Do the same with other bread slices and make 24 mini triangles. Meanwhile heat oil to 190 degrees Celsius or hot enough that you put the batter in and it floats to the surface of the oil, bubbling within 10 seconds. Now dip and coat each triangle into batter and fry until its crisp and brown on the outside. Take them out onto your serving platter and sprinkle some chaat masala (optional). Serve hot with mint chutney or just as it is. They taste great. Wash, dry and cut all the vegetables as instructed. Take a deep mixing bowl and make the batter by mixing all the spices, baking powder and flour with water. Use a whisk to avoid lumps. 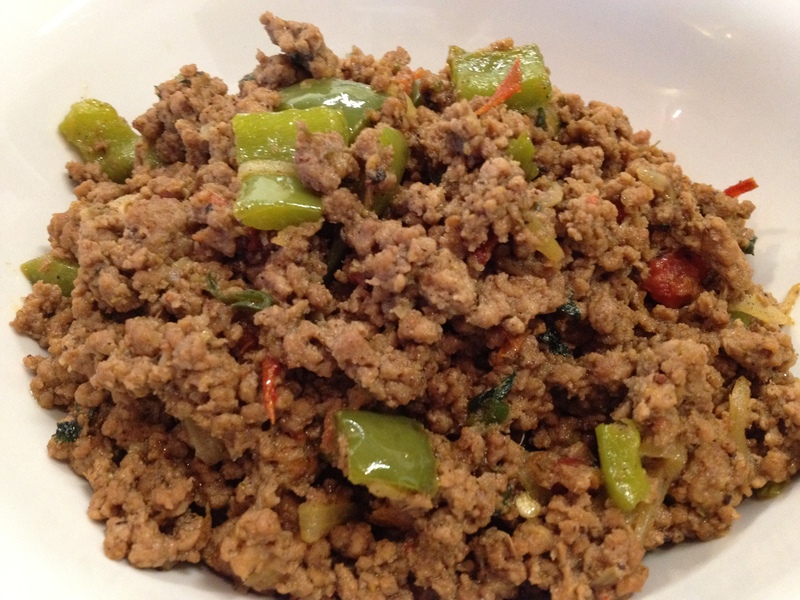 Preheat the oil in karai and test if it is hot enough by dropping some batter in oil. If it comes up to the surface splattering that means the oil is ready. Now dip each piece of vegetable in the better and fry until the pakora is crisp and brown. Please make sure the oil is on medium flame, if it is too high the vegetable will be raw from inside and if it is too low the batter will soak a lot of oil and it may not be as crispy as we want it to be. Take out all the pakoras on to the serving platter and serve hot with Imli chutney or mint sauce. 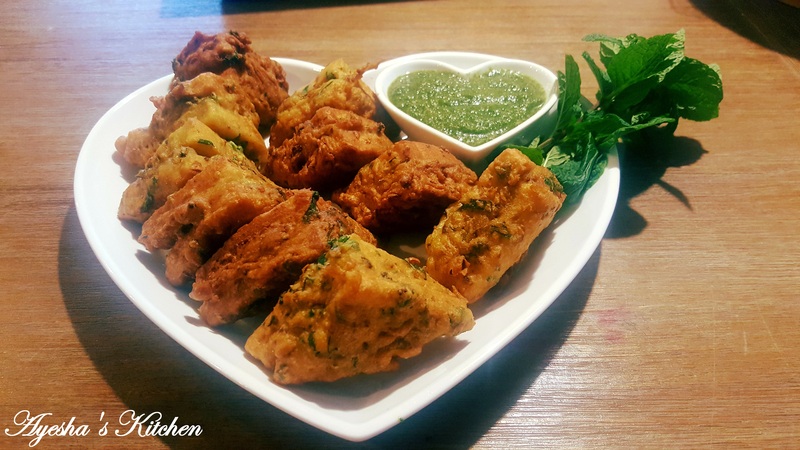 Paneer Pakora is a famous vegetarian Punjabi street food in India. Cubes of Indian Cheese (Paneer) coated in crispy, spicy gram flour batter makes everyone drooling. Its yum!!!! In a mixing bowl combine all the ingredients for batter and add water to make a medium consistency batter. Add paneer cubes and coat each cube with the batter. Keep aside for 10 minutes. Meanwhile heat the oil in the fryer. Now drop each battered cube separately in hot oil and fry until it is golden brown and crispy. Take our the pakoras and serve hot with mint chutney or tamarind sauce or both. My favorite pakoras!!!!!! I remember when I used to shop at Liberty Market, Lahore (Pakistan), these pakoras were always on my “shopping snacks list”. I love street food and Thank GOD I don’t have any immune system issues. I can eat, drink, digest and sustain all this food easily, I never get sick after having them and whenever I go out for shopping (no matter what shopping; clothes, books, shoes anything) I always choose the markets with best street food. The thing I like about these Pakoras is that they give veggies a lite coating of flour mixture, just to give an extra crunch and to hold them together which makes them lite otherwise Pakoras people make at home during Ramadan are just so dense and cake like. So here is the recipe……. enjoy! -Make sure the batter is smooth, no lumps of flour. -Now add all your sliced veggies and mix with your hands. -Keep aside for 30 minutes. 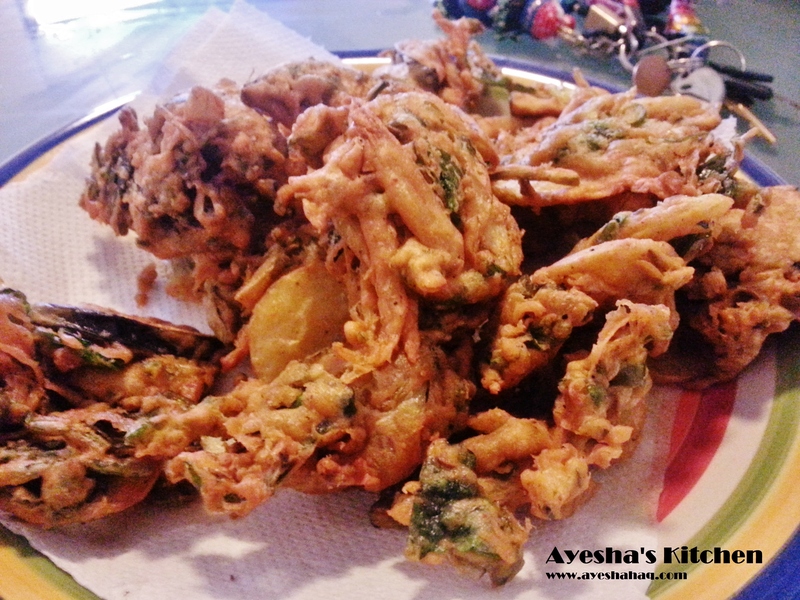 -Now drop tbspns of the pakore batter into the hot oil and fry until the pakoras get crisp and brown. Take them out onto your wire rack or any strainer BUT NO PAPER TOWEL. 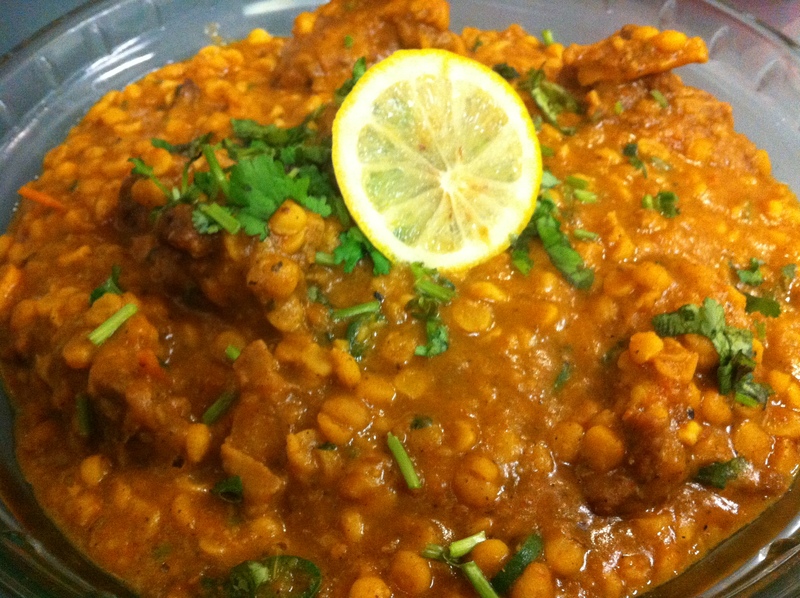 We don’t want our pakoras to get soggy. So put them on anything that is 1 cm above the surface of your bench top and has holes in it. 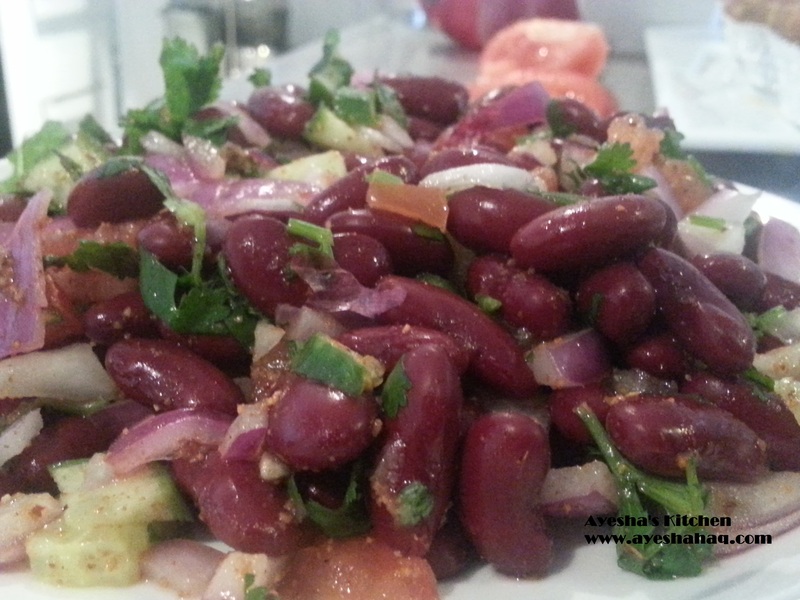 -Sprinkle some chaat masala for extra kick and serve hot with tamarind sauce or mint chutney. 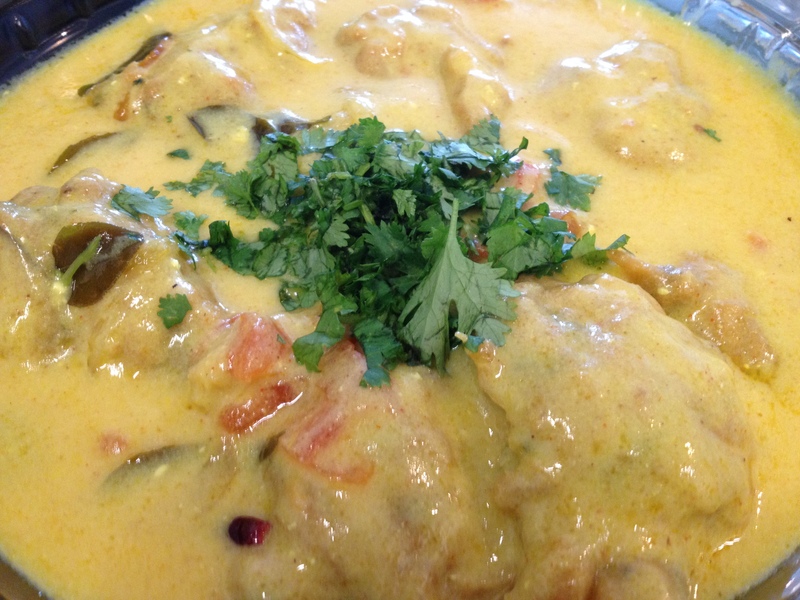 Kadhi pakora is a very famous dish of South Asian subcontinent specially among vegetarian community. Gram flour dumplings, dipped in yogurt sauce with some nice aroma of curry leaves……. 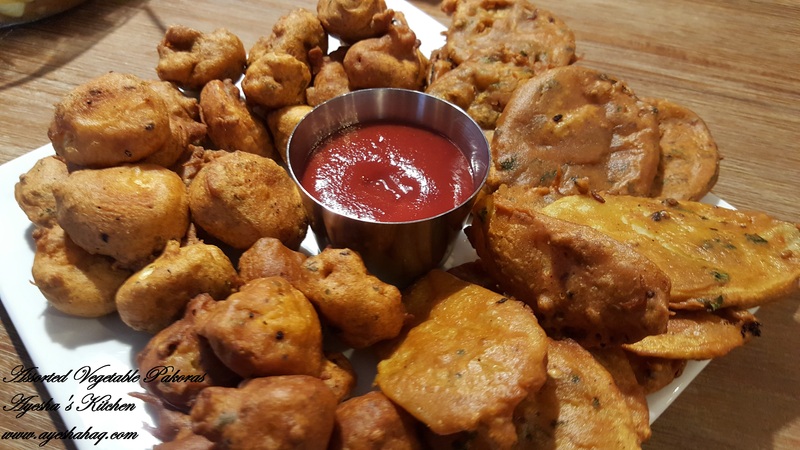 -For pakoras, mix everything (except oil) in a mixing bowl and mix well. Keep aside for 10 minutes. Heat oil and fry pakoras in it. -For Kadhi, put everything in a blender and mix well. -Pour this mixture in a deep pan and let it boil for like 30 minutes on medium heat. 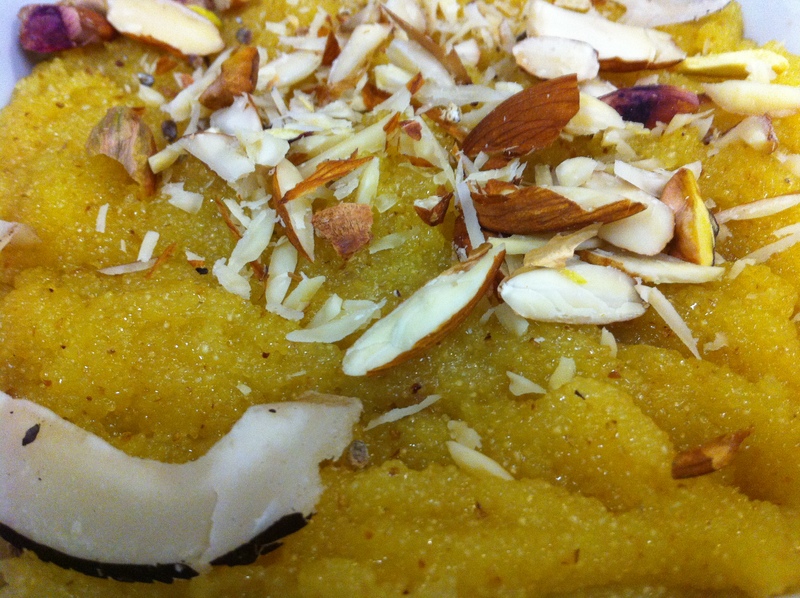 -For tempering, heat oil and and ghee in a frying pan and fry everything else in it. When the tomatoes are done add this mixture to the boiling Kadhi and mix. -Now dip fried pakoras into it and garnish with some coriander. 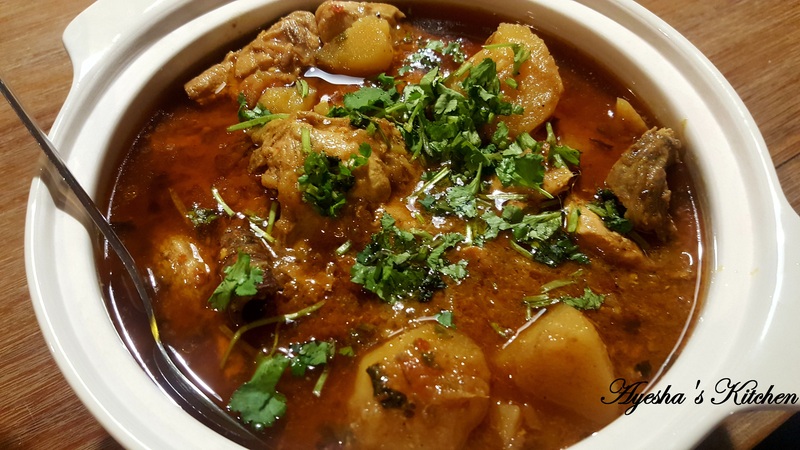 Serve hot with boiled rice or roti. 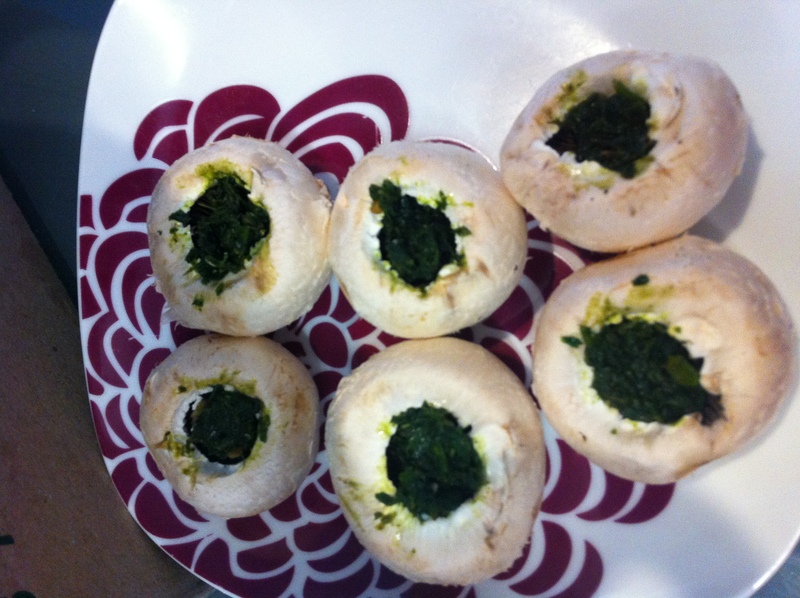 Stuffed Mushrooms (Mushroom Pakora) is my own recipe, Mushroom is one of the best sources of protein and this is the best recipe to consume mushrooms in the Month of Ramadan …. -Combine all the ingredients given for filling in mortar and pestle and make a chutney sort of mixture. -Combine flour and spices in a mixing bowl and make a nice, smooth batter by adding water gradually. 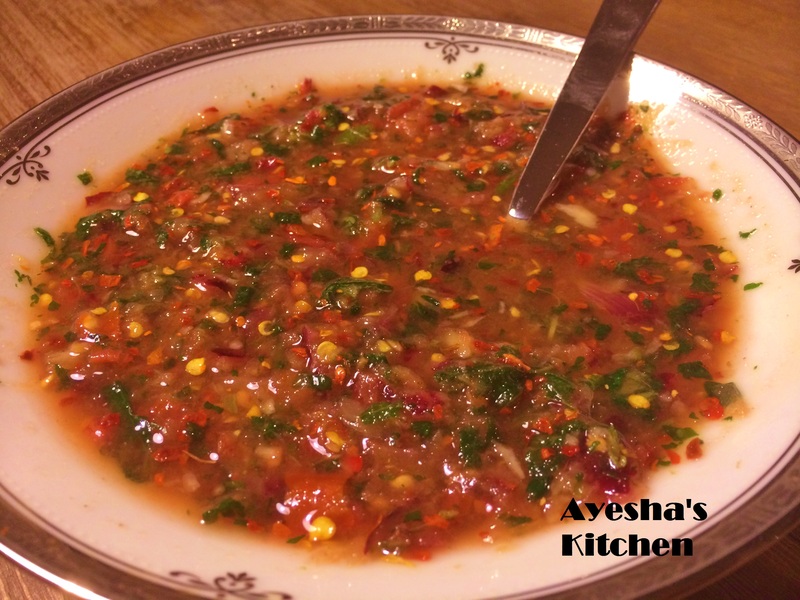 -Now add chilllies and coriander. Mix well. -Heat oil to 190 degrees Celsius. 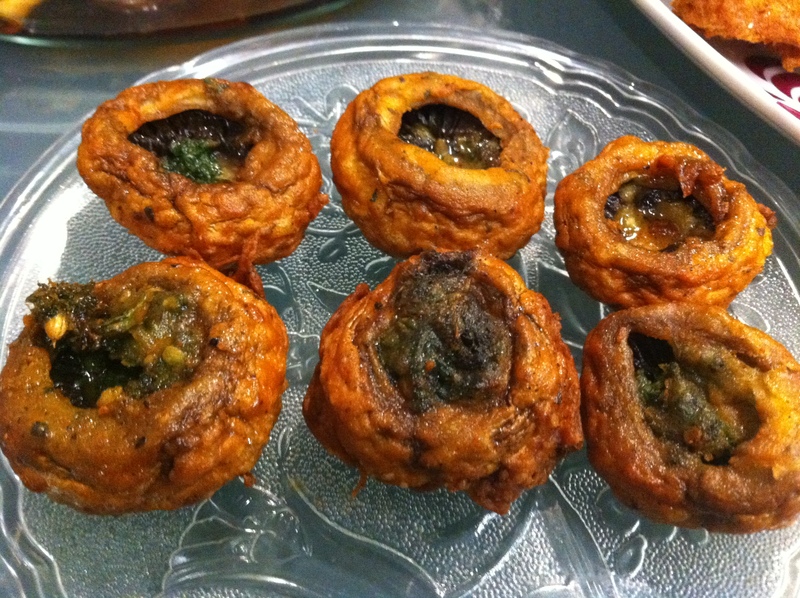 -Take out the stem of button mushroom and fill that hole with some mint coriander filling, dip it carefully in the batter and fry until its golden brown. -Repeat the same with others and serve hot.